Why is she so special? An audacious use of technology and unique styling make the Falcon an unforgettable sight on the water. “She was designed without any attempt to be ostentatious or to conform to a set style – it was very much a case of ‘form follows function’, albeit with very careful attention to essential design principles, balanced proportions, and uncluttered and purposeful shapes. The yacht is significant in her innovative sailing system, and our studio took this as a cue to develop the design around such technology, with every effort to come up with beautiful and unique solutions aimed at highlighting her unique rig. She is not a ‘trendy’ design, but the result of going back to first principles, coming up with original solutions, and achieving continuity of concept from the external styling to the interior design,” says Ken Freivokh. “A case in point is the design of the ‘spider’ feature on the aft deck. It was the result of a last-minute request from the naval architects to achieve optimum separation between the bearings at the mizzen mast. Gerry Dijkstra said: ‘If we had to place the top bearing for the aft mast a metre above the deck, in the middle of the aft deck, would that be a problem? Can you come up with a way to do this that the owner will not object to?’ We came up with an elegant and purposeful set of arches or buttresses to shore up the bearing in question, and to underline what a unique ‘machine’ the Falcon is. It’s expressing function very much along the lines of a watchmaker showing the inner workings of a beautifully crafted watch,” he adds. 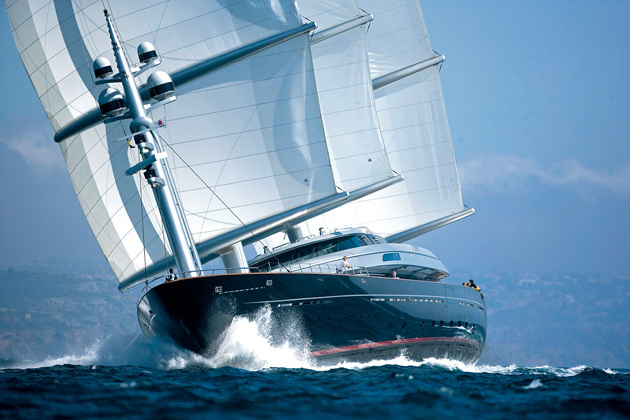 “The Maltese Falcon was, and remains to this day, ahead of her time as a sailing masterpiece, fusing the awesome racing performance of a thoroughbred with the luxury of a superyacht. She is a thrill to sail. The unforgettable moments I’ve had on board include setting off under sail without engines from the dock in Antigua, gliding under the San Francisco Bay Bridge, flying past the Statue of Liberty in NY, and exceeding 24 knots cutting through the seas around the volcanic island of Montserrat,” says her current custodian. Where is she now? Available for charter through Burgess for €400,000pw.